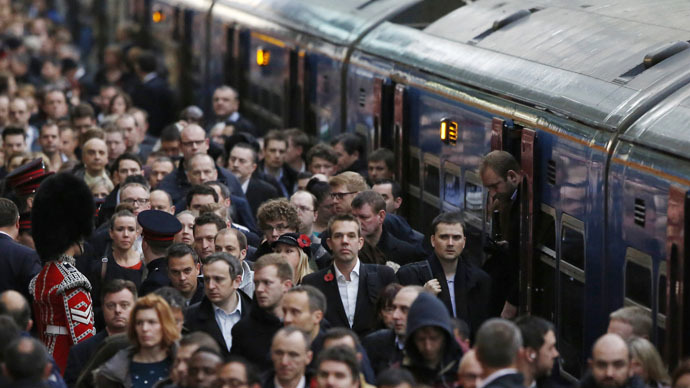 Hate crimes motivated by racial or religious hatred carried out on trains are on the rise with 1,468 incidents reported in 2014, a freedom of information (FoI) request has revealed. Figures revealed to the Press Association by the British Transport Police (BTP) reveal that crimes of this nature have steadily increased, with incidents up from 1,351 in 2012 and 1,364 in 2013 – a rise of nearly 9 percent over the three years. Offences range from verbal abuse to aggravated assaults and included cases of malicious wounding and grievous bodily harm. The BTP suggest the figures weren’t quite right, however, with a spokesperson telling the Telegraph newspaper: “It is always disappointing to see any rise in crime, though it should be noted that the rise in this case is just 8 percent, which equates to just two offences each week. “However, any crime or incident of anti-social behavior, which is motivated by racial hatred is particularly abhorrent and British Transport Police is working [sic] hard to drive such behavior from the railway. Some argue the blame lies with those at the top. RMT transport union chief Mick Cash said: “These are shocking new statistics which show a marked increase in racially aggravated incidents, exposing the sheer complacency of rail and tube bosses despite a weight of recent evidence suggesting that the safety of passengers and staff is being compromised. “De-staffed stations and over-stretched and over-crowded services are core factors in this increase in racially motivated incidents as far as our members are concerned. In February, a video emerged showing a black man in Paris being forcefully pushed off a subway train by rowdy British Chelsea FC fans headed for a match with Paris Saint-Germain. They chanted “We're racist, we're racist and that's the way we like it” as the man tried to squeeze past them several times, before being shoved back.